There is a quote by the CEO of LL Bean and it goes: “A lot of people have fancy things to say about customer service, but it’s just a day-in, day-out, ongoing, never ending, unremitting, persevering, compassionate type of activity.” I really like this quote because I feel like by the time you get to the word “ongoing” in this sentence, you’ve already begun to feel the doldrums of what it can occasionally be like to work as a Customer Service Representative whose whole day is filled with solving other people’s problems and listening to their complaints. But when you reach the word “compassionate”, it brings you full circle back to the idea that at the heart of every Customer Service Call Center, lies a group of people whose sole purpose is to help you. Those people know there are certain customer service rules that should always be followed. Recently, I conducted a general training overview for the Customer Service Representatives that work for the Portfolio Companies here at ABG Capital. They all do very different jobs, but their one common and most important attribute, is that they are here to help our customers solve problems. Everything they do, every single day, is directed with one objective in mind: pleasing the customer. Our customer is the one person in our company who has the power to fire everyone who works here, from the CEO on down the line, and he or she can do so simply by spending his or her money elsewhere. Most of the team members who attended the training agreed that it was helpful in refreshing some of the Customer Service skills they’d learned in the past. Many of them took away some new techniques on how to provide truly excellent Customer Service, going above and beyond what is expected, and even how to deal with the occasional difficult caller. So how do you provide this excellent level of customer care? What do customers really desire? The answers are probably more straightforward than you think. Providing excellent customer service means providing a quality product while satisfying the needs and the wants of the customer. If you can manage to do these two things, you will have a repeat customer. Excellent service results in the continued success of your company, increased profits, higher job satisfaction, and even better teamwork. When your coworkers see you modeling a positive attitude and going above and beyond, it fosters the type of environment where everyone wants to contribute to a high level of service. Good service equals lasting relationships, average service can result in steady customer relationships that could be lost if something better comes along and poor service will almost always result in lost business. Create a positive experience for the customer. Go above and beyond customer expectations. Help win a customer’s trust and confidence. Tailor your service approach to their needs. 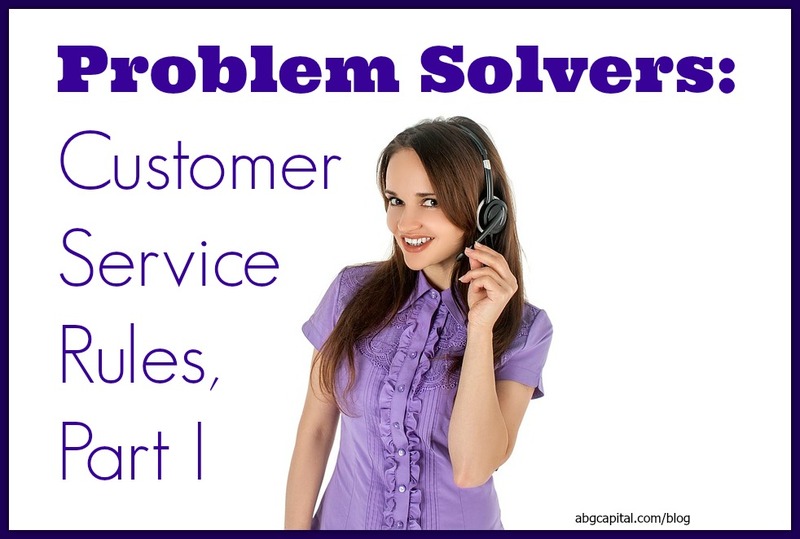 Get to the root of customer dissatisfaction by talking to people and understanding complaints. Every contact with a customer leaves an impression. Be solution focused rather than problem focused. Research shows that 7 out of 10 customers will do business with you again if you resolve a complaint in their favor. We had some open discussion at the end of our training and heard some great customer service stories. Some stories were about really successful resolutions, some were so funny the whole room was laughing, and some delved into the harder to solve situations and what to do when you’re faced with an irate caller or a problem you can’t fix. As always, we love to hear from our readers, so if you have any customer care tips or a great customer service story, please leave us a comment. In our next blog post, we’ll continue with Part II and give you five more outstanding customer service rules! This entry was posted in Customer Relationship Management, Customers, small business and tagged Call Center, Customer Service, customer service representatives, customer service rules, customer service tips by Natalie DeCario. Bookmark the permalink.